Minolta made lots of rangefinder-type cameras as well. There are too many of them to keep in my brain, so I pilfered this info from the McKeown price guide. The Minolta 35 series (Leica-type cameras with interchangeable lenses in 39mm screw mount) began in 1947. There were six minor variants of this original model, followed by a "Model II" in 1953; all of these made 24x32mm images. A Minolta 35 Model IIb, making regular 24x36mm pictures, finally appeared in 1958. These were finely-made, expensive cameras and have a good reputation. There was also a long series of more economical models with leaf shutters and non-interchangeable lenses; these started with the very basic Minolta A of 1955 and continued up through the range of the Minolta A5 of 1960. The top of this line was the Minolta Super A of 1957, which still used a leaf shutter but had a limited range of interchangeable lenses (35, 50, 85, 100 and 135. Then there were various other "consumer" models with built-in light meters, leading up to the very respected and popular Hi-Matic series. Interesting byways along the road included the Minolta 24 Rapid, which made 24x24mm pictures, and the Electro Shot of 1965, which was the first 35mm lens/shutter camera with an electronically controlled shutter. Most exotic member of the breed was undoubtedly the Minolta Sky, which Minolta planned to introduce in 1957 to compete with the Leica M3. It would have been a very sophisticated competitor, with bayonet-mount lenses, bright-frame finder and other state-of-the art features of the day. 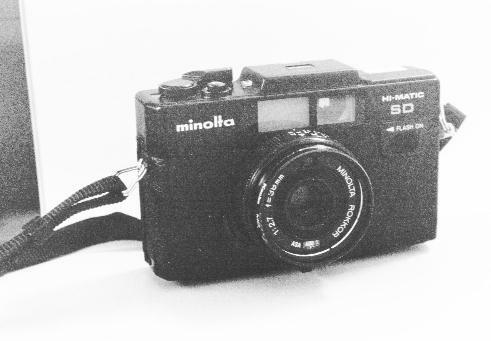 However, Minolta apparently realized the trend was shifting to SLRs and cancelled the Sky in favor of concentrating on its first 35mm SLR, the SR-2 of 1958; all that remains of the Sky is a run of about 100 pre-production prototypes. Finder: 0.5x maginfication, 85 percent of real image seen, 5 zone focus marks and needle for pointing it, Date print position mark, low light warning lamp. HiMatic SD and SD2 use two AA-size (penlight) cells. A nice improvement from old HiMatic which used a mercury cell, now hard to get. The Minolta Hi-Matics date back to the early 1960's. The Hi-Matic 7 introduced in 1963 was a fully automatic (needle capture) rangefinder with a 45mm f1.8 lens. It also could be used in a metered manual mode. It was followed by a series of nearly identical camers with added features. The 7s added a hot shoe. The 9 had an f 1.7 lens and an "easy flash" system that adjustes the aperture as you focussed. There was also an 11 (I don't know how it differed from the 9). All are prone to "sticky needles" but are generally reliable cameras. The HiMatic 5 has no rangefinder. In the 70's the HiMatics became alphabetic starting with the C. It was a fully auto scale focussing camera with only two shutter speeds (1/30 and 1/250). It also featured a pop-up lens. The E is a fully automatic with a 40mm f1.7 lens. It has a flash system like the 9/11 but can be set for a variety of guide numbers. The F (1974) is similar to the E only smaller, with a 38 mm f2.7 lens. The G is a scale focus camera. There's a web page about the 7sII here. Here's some information on the battery requirement of the various models. In another message you asked what Minolta literature I was referring to when I said that the 7sII uses a PX675 mercury battery. Like you I don't have an instruction manual for the 7sII, but I do have two different older Minolta Product Catalogs which I was given by a local Minolta dealer who was updating to newer sales literature. Each has a battery guide page, and both show the 7sII with the mercury battery. The Hi-Matic G, C, and S are also listed as taking the PX675, and the 7, 7s, 9 and 11 take the PX625, just as you said. The Hi-Matic FP, E, and F are listed as taking two E640 (Eveready) or RM640 (Duracell). I must also report the same experience as Mr. Williams, whose response you forwarded to me. One of my 7sII cameras came with an S76 and seemed to give quite good results with it. But for the record, Minolta does seem to specify the mercury battery. Now, to add further to the debate, I have noticed zinc-air hearing aid batteries at the local pharmacy with a version of the 675 number in the same physical size. Everything I have read says that zinc-air batteries are the best substitutes for mercury cells. However those same sources also recommend zing-air cells marketed for photo purposes although they are more expensive than the hearing aid batteries I've seen. I think the camera was one of popular P&S models in those days(early 1980'). The camera has focus lock lever also. When pushed down, a camera rotates a lens and stops when a subject(center frame) is focused. Now you can compose freely and release a shutter. Nice feature. A downfall is, you cannot use focus lock twice. You can not use focus lock once you pushed the lever until you release a shutter and exp. is finished and turn winding lever for next shutter charge. Four marks are printed above a composing frame in a viewfinder. There are four figures, mountain, three people, one person and a figure above his chest. Each figure means a distance from a camera to a subject. Mountain means infinity, a figure above his chest means 1m, minimum focus length of the camera. When you push a shutter button or focus lock lever, LED flashs above one or two of those figures. When two LED flashes such as moutain and three people, it means a subject distance is between them. That'a way, you can know how a camera's focus sensor worked. When you slide flash switch, it pops up and starts charging. Self timer is mechanically controlled(buzz sound you hear). The body looks fat/large compared to today's P&S.